Ravichandran Ashwin, as a competitor, hardly ever gives an inch to the opposition. That applies both figuratively and literally if you’re the non-striker. So it’s no surprise to see the fierce passion with which he leads Kings XI Punjab. He’s out there to win, and he’s going to give it everything – at least whatever’s in his powers – to achieve that. It may work, it may not work, but it won’t be for the lack of trying. When Kieron Pollard was going berserk at the Wankhede, Ashwin ran in with his non-bowling arm stuck to the body, like it was dead weight, to serve as a distraction. When Virat Kohli and AB de Villiers were in cruise control, Ashwin skipped in every different direction on the return crease bowling carrom ball after carrom ball. When Delhi Capitals looked like they had the game won, Ashwin – the weakest of links in the field – ran Chris Morris out and played a role in the ultimate turnaround. 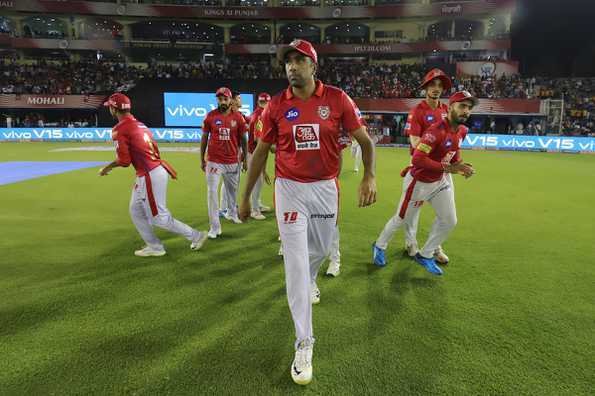 And on Tuesday (April 16), when Kings XI Punjab were stuttering towards the end of their batting innings against Rajasthan Royals, Ashwin – with an IPL strike rate of 110 – smashed two sixes and a four in the final over to lift them to a total of 182 which probably made the difference in the end. In Mohali, on a flat pitch, it’s not that 182 was a safe score. If anything, as Ashwin himself admitted after the match, it was 10-15 runs below par. And it certainly appeared to be that way when the partnership between Sanju Samson and Rahul Tripathi was going strong. After nine overs of the chase, the Royals were in control on 85/1. But Ashwin, who had gone for 10 in his first over, wasn’t done for the night. He came back to apply the brakes, conceding just four runs off his second over. With Murugan Ashwin providing handy support at the other end, the pressure was now starting to build on the visitors, who were further bogged down with the baggage of messing things up from similar positions in this tournament. Samson was the first to succumb. Because Ashwin gave nothing away with his carrom balls and under-cutters, Samson felt the need to manufacture a boundary, and so he went down to sweep a delivery on off stump, missing it altogether. If that wasn’t the killer blow, the 16th over of the innings where he gave just five runs and took the wicket of Tripathi most probably was. In between, Ashwin had played his cards well. With Ajinkya Rahane not likely to take many risks having just arrived to the crease, Ashwin had slipped in an over from Mandeep Singh to compensate for Mujeeb Ur Rahman’s injury. He had also bowled three straight overs out of debutant Arshdeep Singh – capable of ‘swinging the ball both ways’ – in the powerplay, thus saving Mohammed Shami’s experience predominantly for the second half of the chase as insurance. This was as much a win for Ashwin – the captain, as Ashwin – the bowler. And with each such win, the right-arm spinner has lent credence to the big chip he’s been carrying on his shoulder. Before the start of IPL 2019, Ashwin had lamented his exclusion from India’s one-day formats. The last time he played for India in coloured clothing was in mid-2017. And he attributed it to a perception of wrist-spin being the way to go, rather than actual statistics. The sentiment of getting a raw deal has probably served as an added motivation for the 32-year-old, spurring him on in this IPL to prove a point. Among Indian spinners, Ashwin is the second-highest wicket-taker in the tournament so far, only behind Yuzvendra Chahal. His economy rate of 7.44 is particularly impressive considering he’s played more than half the matches in Mohali, where the pitches have hardly offered much in the way of turn. In the five matches played in Mohali so far, while other spinners have given runs at an economy of 7.86, Ashwin has gone at 7.05. That he’s able to produce the goods despite being neglected consistently in the limited-overs formats, is commendable. It possibly comes from a desire to prove people wrong. “I’ve always lived and died by the sword. I’ve worked on a lot of things. Despite people actually calling me for trying too many things, I kept on going,” Ashwin said at the post-match presentation after the Royals game. Or maybe it’s just the dedication to get better all the time. “It’s always a process. A spinner is someone who reinvents all the time. For me, it’s about trying to get various lengths at different speeds. Trying to get the batsman with the under-cutter, the reverse carrom”. Ashwin wasn’t named in India’s World Cup squad that was announced a couple of days back. He wasn’t expected to be. But when he bowled against the Royals, none of the non-strikers dared to back up too far, because he didn’t give the opposition an inch. He also skipped in every different direction on the return crease for his carrom balls, led the team with a lot of passion, and tried everything in his powers to win.